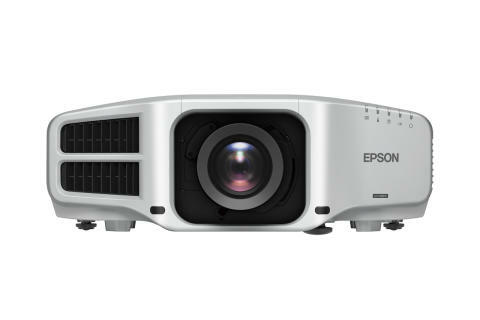 [Kuala Lumpur, 30 June 2016] – Epson, the number one projector brand worldwide, today announced the launch of its next-generation EB-G7000 high brightness projectors for large venues. The latest series of projectors are equipped with the latest 4K enhancement and deliver brighter and more vibrant images at up to 8,000 lumens of both colour brightness and white brightness1. An Epson first, the projectors come with motorised lenses, enabling highly precise adjustments when employing edge blending and other features such as curved screens, and superb flexibility in projector placements. The EB-G7000 series also feature the world’s first zero-offset ultra-short throw lens with a throw ratio of 0.35, useful for environments with extremely limited lens-to-screen distances. With this, projections can be made onto 100-inch screens from as close 43cm away. The EB-G7000 series’ super-resolution technology delivers razor-sharp images even when projecting low-resolution content. The projectors come with dynamic projection capabilities including advanced built-in edge blending, projection on wide curved and corner spaces, as well as point correction, amongst other innovative applications. By combining Epson’s proprietary C2FineTM (Crystal Clear Fine) Technology, inorganic LCD panels and Epson’s optimised cooling system, the EB-G7000 series can operate 24/7 without requiring rest periods. The EB-G7000 series deliver high quality bright images and operate on low noise, making them ideal for meeting rooms, lecture halls, museums and any other venues. Epson projectors offer three times higher colour brightness2 than competitive 1-chip models to ensure vibrant, colourful images. Nine Optional Interchangeable Lenses: Increased installation flexibility allows users to choose the motorized lens most suited for their environment; variety of ranges include an ultra-short throw, two short throw, one wide throw, four middle throw and one long throw. A quick-release lever enables fast, easy lens exchange. 4K Enhancement Technology: A revolutionary technology that accepts 4K signal and improves 1080p experience for movies3. Available on select models. Collaboration Features: With Split Screen function, two different sources can be projected side-by-side. The free Epson Moderator software allows up to 50 Windows®, Mac®, iOS® or Android™ devices to be connected over the network, with up to four of them displayed on the screen simultaneously. Professional Installation Features: Full 360-degree installation flexibility, including Portrait Mode, allowing for a wide range of applications including simulators, mapping, digital signage and command centre usage. Versatile Connectivity: Supports the full range of inputs, including HDBaseT, SDI, HDMI®, DVI-D, VGA, and 5-BNC, for easy integration with any system. Ready for Integration: Supports Crestron, AMX, Extron, and Control4 protocols for easy and simple integration into existing systems. Select models also support Art-Net DMX for lighting control for staging applications. Emulation: Emulates the control codes of other industry-leading projector brands for easy upgrade to Epson projectors without the need to reprogram existing controller systems. 2 Colour brightness (colour light output) measured in accordance with IDMS 15.4. Colour brightness will vary depending on usage conditions. The projectors used by a third-party lab for measuring colour brightness were leading Epson 3LCD business and education projectors and leading 1-chip DLP projectors. 3 4K Enhancement Technology shifts each pixel diagonally by 0.5 pixels to double the resolution to 3840 x 2160 and surpass Full HD image quality.